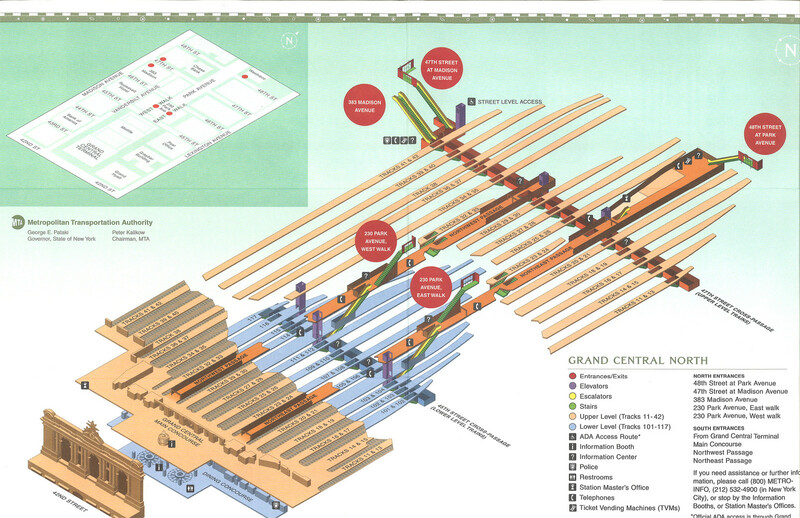 There are underground passages at Grand Central Terminal in NYC that are open to the public. They fan out, underground going several blocks from the main terminal, both north and west. Many people use them each day. The passages are useful when it is raining or very hot or cold outside. However, it seems not all tracks provide access to all the passages. It seems some tracks have an exit at the northern end direct to either the northeast or northwest passage. Other tracks have an exit to the 42nd St east west passage. There seem to be some connections between these passages. It seems the 42nd and 45th St passages go east west and are one flight below the northeast and northwest passages. Where can I find a map of these passages, that shows where they have exits to the street above and which tracks have access to the several passages? I found this map posted on Flickr, though I can't vouch for its accuracy. Given the names listed as governor and MTA chair, it is somewhere in the range of 10–15 years old. If this map is correct, most of the upper-level platforms have direct access to the 47th St. cross-passage, from which one can then exit at either of the 47th St. exits. Alternately, one can follow the 47th St. cross-passage to the Northeast or Northwest passages, which can then be used to get to either the Park Ave. exits or the 48th St. exit. The only upper-level platforms for which this does not apply are 23/24 and 32/33; these have staircases leading directly to the Northeast & Northwest passages (respectively) instead. All of the lower-level platforms should have stairs leading to the 45th St. cross-passage; from there, one can access a set of stairs leading up to the Northeast and Northwest passages as well. Not the answer you're looking for? Browse other questions tagged new-york-city train-stations or ask your own question. Where can I drop a rental car and switch to a train when traveling to New York City from the west?